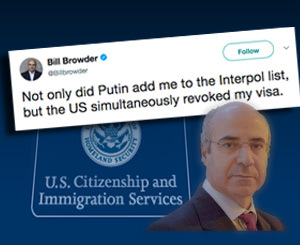 On Oct. 22, 2017, American-British financier Bill Browder tweeted, “Not only did Putin add me to the Interpol list, but the US simultaneously revoked my visa." Browder is the hedge fund manager turned human rights activist who championed the Magnitsky Act, a 2012 U.S. law aimed at punishing Russians officials involved in corruption, which was passed following the mysterious 2009 death of Browder’s Russian lawyer while in custody. The U.S. government quickly reversed itself, saying Browder’s revocation was an administrative mistake. The brief flap raised the legal question: On what grounds can the U.S. revoke an individual’s visa? The initial action against Browder, an outspoken critic of Russian leader Vladimir Putin, triggered strong bipartisan criticism on Capitol Hill and from media pundits from both the left and the right . Even so, if it had not been administratively reversed, the visa revocation would likely fall within legal bounds. The U.S. Department of State has given its consular officers wide authority to revoke a noncitizen’s visa to enter the U.S. And courts have largely sided with the government. The snafu involving Browder related to his ESTA travel waiver, which enables citizens of the United Kingdom to travel to the U.S. without a visa. It erupted and deflated quickly over 24 hours. For background, the U.S.-born Browder lives in England and carries a British passport. Globally, he has become synonymous with the Magnitsky Act, which grew into a front-burner topic in the Russian probe of President Donald Trump’s associates. Russian lawyer Natalia Veselnitskaya has said she was lobbying for repeal of the act when she met with Donald Trump Jr. in June 2016 at Trump Tower in New York. Browder, the grandson of the leader of the American chapter of the Communist Party during the FDR era, emerged in the early 2000s as one of the most successful foreign investors in Russia. His Russian lawyer and auditor, Sergie Magnitsky, exposed alleged Russian corruption in 2008, untangling a dense web of tax fraud and graft involving 23 companies and a total of $230 million linked to the Kremlin and individuals close to the government. Subsequently, Magnitsky was accused himself of commiting the fraud. He was detained, allegedly beaten and died in custody, apparently after being denied medical treatment. The 2012 U.S. law that Browder championed was named for the lawyer, and initially blocked 18 Russians — government officials and businessmen — from entering the U.S., froze any of their assets held by U.S. banks and banned their future use of U.S. banking systems. It has since been expanded to include 44 names worldwide. Browder has worked to get other countries to adopt similar legislation, most recently on Oct. 19 in Canada. The Russians have retaliated for Browder’s efforts, attempting four times without success to place him on a criminal watchlist through Interpol, the international police organization with 192 member countries. Taking advantage of a loophole, the Russians coaxed Interpol to finally issue a similar alert shortly after Canada passed its Magnitsky legislation. On that day, Browder said he was notified by the State Department that his ESTA waiver was canceled. The next day, he tweeted “my ESTA was restored” and he accepted the explanation provided by the U.S. The U.S. Department of State has broad authority to revoke an individual’s visa even if it is stamped on the passport. Revocation of a visa while in the United States still allows that person to remain and maintain status. It is only when the person leaves the U.S. that he or she must deal with the revocation and apply for a new visa, if eligible. Browder’s problems stem from Russian allegations of his criminal activity — past and present. He was convicted in absentia in 2013 of tax evasion by a Moscow court and sentenced to nine years in prison and is said now to be under investigation again. But most U.S. observers say these were trumped-up charges to deflect allegations of criminal behavior by influential Russians. The courts have generally sided with the U.S. government’s position that the Illegal Immigration Reform and Immigrant Responsibility Act of 1996 strips the courts of jurisdiction to review certain decisions “specified” by statute “to be in the discretion of the Attorney General or Secretary of Homeland Security.” Eight federal circuit courts have embraced that legal argument, with only the U.S. Ninth Circuit Court of Appeals ruling otherwise. In the most recent case, Bernardo v. Johnson, a three-judge panel of the U.S. First Circuit Court of Appeals ruled 2-1 in 2016 that the petitioner was not entitled to a court review because the revocation of the petition underlying the visa fell within administrative discretion and was not based on legal issues per se. “We join seven of our sister circuits and conclude that this decision is discretionary, and so not subject to judicial review,” the majority said. The U.S. Supreme Court declined to consider the case in June 2016.